Don’t get me wrong. Sitting down at the breakfast table for a lovingly prepared scrambled egg or (insert your favourite dish here), accompanied by a chat…or blissful silence… is a beautiful thing. I am all in. But we have to be realistic. And honest. What happens most mornings? The bed is comfortable. You stretch, wake slowly, check your emails, try to remember that important thing you know you have to do today. . And suddenly you have all but 15 minutes left to shower, get dressed and eat breakfast. I am very quick at making scrambled eggs. And very fast at eating them. But sometimes measures need to be more drastic. Sometimes you need a Grab and Go breakfast. I have been warming to the grab and go meal ever since a great friend gave me a “Grab cup” (brilliant marketing speak!) from our favourite cafe to remember the many hours we have spent there. This thermos cup with its handy sipping hole (you can buy one just like it here) has become one of my most needed items. Before I race the family out of the house and into London’s traffic jam, I pour the rest of my coffee into it and take little sips of happiness in the car. So why not add to this moment of zen? Give you even more time to enjoy waking up in peace? Exactly. 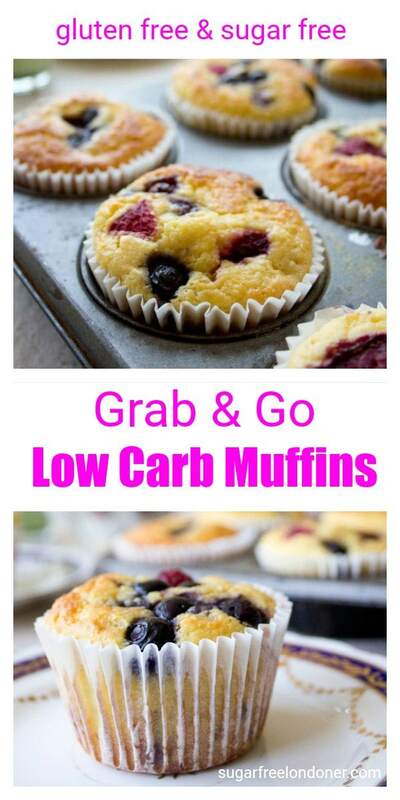 Have a grab & go low carb muffin. Regular muffins made with wheat flour are probably one of the worst breakfast choices you can make. And if you buy them in the supermarket, you’ll not only get a serious blood sugar spike from all the white carbohydrates and sugars, but also load up on preservatives, stabilisers and e-numbers. You’ll consume a bunch of empty calories and will feel hungry again after a couple of hours. Sorry to burst anyone’s bubble. These muffins, friends, are not only pretty and very, very tasty, they will also keep you going until lunchtime. 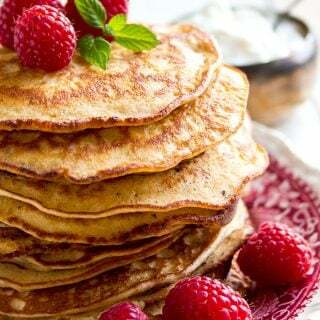 Inspired by this recipe on the great low carb blog All Day I Dream About Food, they are made with almond flour, yoghurt, eggs, butter and berries and sweetened with a little xylitol – you could substitute this with erythritol or stevia to further lower the carb content. If you make a big batch, you can keep them in the fridge or freezer and have one ready for those mornings. They are a great alternative to my savoury egg muffins such as the Chorizo Egg Muffins or the Spinach and Chive Mini Quiches. The only downside I can think of is that you will need to prepare them in advance and then make sure they aren’t eaten up immediately. Obviously, grab & go low carb muffins taste delicious eaten from a plate as well. Preheat the oven to 180 Celsius/356 Fahrenheit. Line a muffin tin with paper cups or even better, use a silicone mould (you don't need paper cups then - just grease it well). Mix your yoghurt, eggs, vanilla and butter well. At the end, carefully fold in the berries, reserving some to place on top. Bake for ca 25 minutes or until the tops are browned and a knife inserted in the centre comes out clean. You can use frozen berries in this recipe. 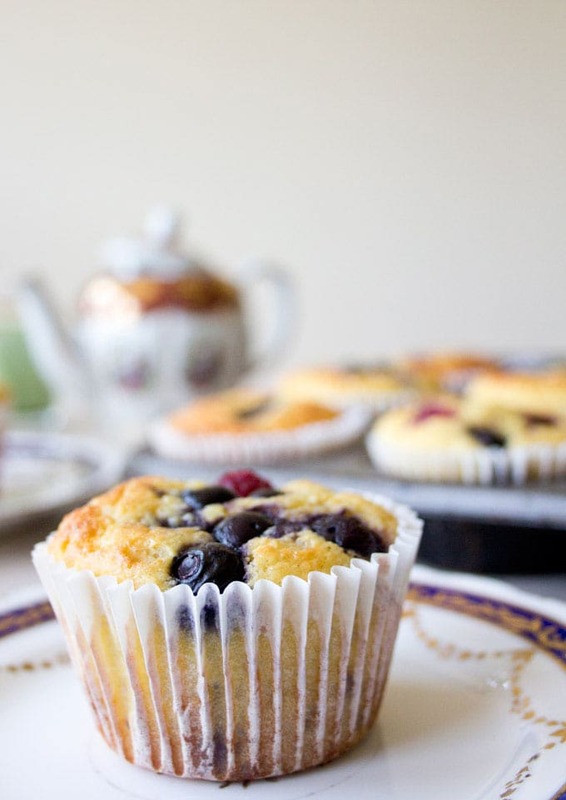 However, fresh berries are firmer and won't "bleed" into the muffin. This post contains affiliate links. If you click on one of these links and buy a product as a result, I earn a small commission. This money helps me with the running costs of this site. Thank you for supporting Sugar Free Londoner. 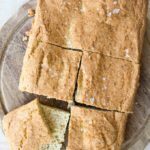 Could I use coconut flour instead of almond as I’m allergic to nuts? And if so does anyone know the amount? Hi Lisa, I’d try 1 1/2 cups of coconut flour in place of the almond flour. I haven’t tried this myself yet, but you need less coconut flour because it absorbs more liquid. Mix your dough and let it sit for a couple of minutes so the flour can expand. Then check the consistency of your batter. If you feel it’s too runny, add 1-2 more tbsp if needed. The rule of thumb for a almond flour to coconut flour conversion is to use 1/3-1/2 the amount. can you replace yogourt by applesauce ? That’s an interesting question. I think it could work – they both have natural sweetness and a similar consistency. Actually, you probably don’t need any extra sweetener if you used applesauce. It would be an experiment though – maybe try out a half or a quarter portion first just in case? It should work, but your muffins would be higher in fat. I think there’s fat reduced sour cream so that might be an option. Or leave out the butter. Let me know what you decide on and how they turn out! I made these like 5 times already.. They come out perfect every time, and I have this recipe saved in my favorites.. 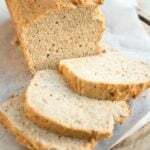 This recipe is delicious, I used almond meal, it worked beautifully. Thank you Katrin for your very tasty and never failing recipes. Thank you for your comment Wanda – I’m so happy you like the muffins! Wish I had watched the video first! Also from the UK and with grams the mixture was much much thicker and so dryer when cooked. Still a nice flavour though so will try again! Maybe put a tip for if you are using grams? Hi Mo, I wonder why yours turned out drier. Maybe your almond flour was really fine? 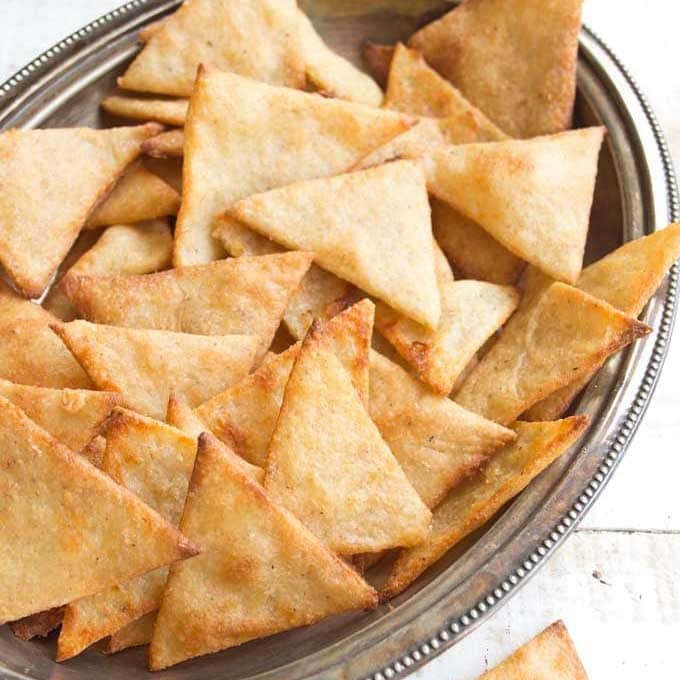 It works well with straight up ground almonds, but an extra fine flour like the Sukrin brand does not work in this recipe. How much in grams did you use of butter? Hi Donna, it would be 56 grams. Just made a batch up using Greek Yogurt watered down a little to mimic the consistency shown in your video, and used Ground Almonds (I’m in U.K) . I was a bit worried the mixture was too sloppy, had I added too much water? Also it needed baking for 15 minutes longer using my silicone bun trays. I managed to get an extra 2 muffins that I baked separately in a metal bun tray and those took just 5 minutes longer. I’ve just tried one and oh my this is a keeper! Will be making these regularly for sure. I’m hoping to freeze a few, wish me luck haha..
That’s so good to hear! I’m really glad you liked them – and how interesting your muffins baked quicker in the metal tray….maybe the baking time was shorter also because you only had 2 muffins in the oven that time, what do you think? I also thought that. Generally I prefer the appearance and texture of cakes baked in metal trays and tins compared to silicone. They both have their advantages depending on what is being made. I did manage to freeze two of the muffins for experiment. I shared the cakes with family, with varying opinions. A few thought there was coconut in the recipe, which I had thought too from the flavour and texture. Also folks would have liked it a bit sweeter (those with a sweet tooth) . One thought it tasted great, and would be happy to eat more. But later in the conversation when I said it had almonds in, they exclaimed ‘Ughh.. I don’t like almonds! !’ Made us laugh ..
Just a quick question…I apologize in advance if this question was already answered. With measurements you listed how many muffins you get? I was trying to get an idea considering that one serving has 261 calories. I wanna make sure that muffins are not too big as they will have higher calorie count. 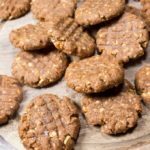 I’d love to try these, but I’m only just starting to be interested in low-carb baking. I prefer natural fruit sugars to sweeeteners like xylitol, so I’d like to experiment with adding a mashed banana and/or applesauce to the batter. I wonder how this would affect consistency? Perhaps I could use Greek yogurt instead of regular, to counteract the thin consistency of applesauce? I will report back with my results if I make these but I would love to hear your thoughts. Hi Alexa, I’d reduce the amount of yoghurt and replace that with apple sauce. You want to get the same wet/dry ratio. Using greek yoghurt instead of regular might also be a good idea. Recently diagnosed as diabetic. 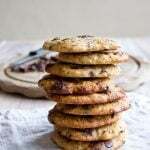 I made a batch of these yesterday and they are fantastic and have really inspired me to try more baking. Hi Dannie! I’m glad you like the recipe. Nut flours really are brilliant. Try experimenting with coconut flour, too – you need a lot less of it than almond flour, which makes it more economical. I think it’s delicious, too! Also forgot to add, how can i post a picture? I used Splenda instead so that counts for some. And are the size of a regular cupcake. I use a free online nutrition calculator – https://recipes.sparkpeople.com/recipe-calculator.asp – you can check it out here. (The calculator I used for the screen shot is not online any more, so I had to switch.) I do my best to be as accurate as possible, but if you need an exact carb count for health reasons you’d need to make your own calculations as products like full fat yoghurt etc can have slightly different nutritional profiles. To calculate the net carbs, I subtract the fibre from the total carb count, which would make my (larger) muffins 5 net carbs. Just made my first batch and the texture is lovely but I found there was a slight bitter aftertaste – I followed the recipe to the letter although I did add just a little extra sweetner (I used erythritol) – any idea why that might be Katrin? Having said that they were still yummy! I’m glad you like them. As for the aftertaste – this might have been the almond flour (check how fresh it is? It can go off, that’s why I always store mine in the fridge)… or could have been the sweetener? Erythritol has a slightly cooling taste, but I do find brands differ in taste. Some taste more “fake” than others. I think it would work too. Might taste a bit more rustic! Looking for school bag snacks, could I freeze these and whip them out in the morning for the children to take to school? I am dairy free, can I sub coconut milk or cream for the yogurt? Really delicious muffins. I’ve made them several times now and they always go down a treat. Can I make this into a loaf at all? Made these yesterday for my grandson who is a Type 1 diabetic. He loved them. So did the rest of the family. Will now be a regular item in our house. Thanks Katrin. How wonderful! I’m glad you all liked the muffins! Delicious muffins. We make them all the time. Keep up the good work! Wow, this recipe is amazing. I made a double batch and froze half. Looking forward to many more muffin breakfasts! I halved the recipe, added some Linwoods milled seedmix (a large sprinkle), a few chopped walnuts and about 15 high choc content drops (works out at about 2 per muffin) Accidentally kept the butter for double but all turned out beautifully. Definitely be making these again. Great news! I’m glad you enjoyed them. Thank you for leaving a comment – and a nice twist adding the walnuts and chocolate! Loved these muffins! I used a blender for the wet ingredients and they came out of the oven light and pretty close to fluffy. Only problem is the recipe made 24 instead of twelve. So I made 12 blueberry and 12 walnut. Great recipe! Thank you! Hi I’m definitely trying this out but I’m thinking of using tigernut flour instead . The full cream flour not the one they have extracted the milk first. I already make muffins using them and they are really great. Forgot to add sweetener however just dusted some on the top. Still tasted great. 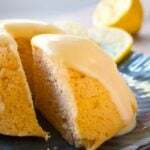 A good introduction to low carb baking. Hello Katrin; I was wondering if you have a muffin recipe with apricots in it? My Dad loves apricots and I am going to pick some next week. I would love to make some apricot muffins or a apricot cake. What do you think? Hi Sheli, I haven’t made anything with apricots in ages – even though I love them! You could try this recipe with apricots instead of the berries, I’m sure it would work. You can also make the dough as a cake, add some mascarpone icing and decorate with fruit, as I did in this almond berry cake. 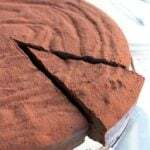 If you want more crunch, you could make the crust I used in this chocolate tart and fill with the mascarpone and fresh apricots. Or make cheesecake and replace the raspberries in this recipe with apricots. Made these muffins as recipe, but used ground almonds. They were excellent and will be a great low carb lunch staple. Hello Jane, thanks for your comment. I’m glad you are enjoying them! How long will these keep for if i keep them in the fridge? Would they last 7 days? They probably would, though I have never kept them in the fridge for that long. If you have a freezer, I’d maybe stick half the batch in there. I feel like it’s just not meant for me to make these muffins right. First attempt: used almond flour, turned out great… except I forgot to add any sweetener so they were awful. Second attempt: used coconut flour (should have read the failed attempts at this in the comments first), dough came out more like sugar cookie dough than muffin batter and made a TON. Didn’t bake all the way through. Still tasted bland and yuck. Third attempt: added water to the previous coconut flour batter until I got a muffin batter consistency and they hardly baked at all. I’m not even going to try them. If I get enough courage I will try to make them again with the correct ingredients. They just look so GOOD! Alexa! You deserve a medal for not giving up. 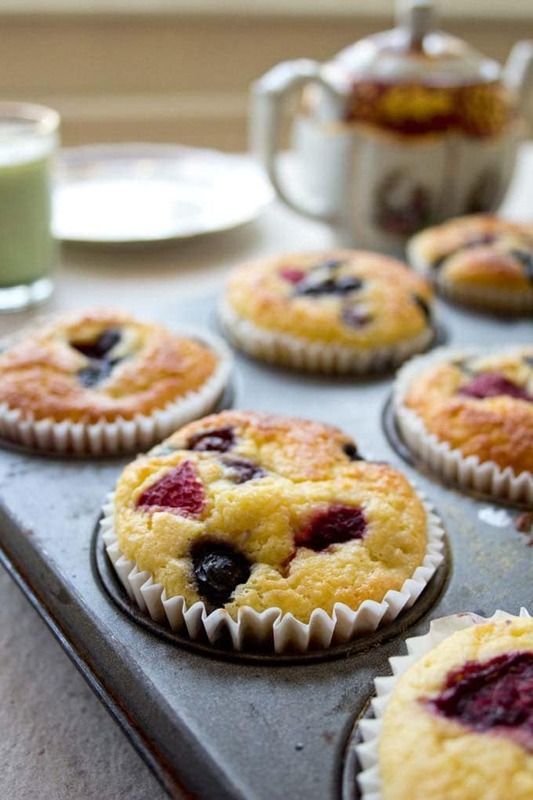 I have an idea – if you want to use coconut flour instead of ground almonds, why don’t you try using my coconut blondie recipe in a muffin tin and just add the berries to that? And definitely try the batter before you put it in the oven – that way you can always adjust the sweetener. Good luck for attempt number 4. It’s going to be a winner, I’m sure! hi!! These look amazing! I am new to low carb and the more healthy alternatives. I am wondering if ground almonds is the same as almond flour? I tried googling it and some say yes some say no. I could I use almond flour instead? How many grams would that be? I have made the muffins over the weekend and they are absolutely delicious! Amazing recipe, quickly done and everybody in my house ate them within minutes!! Will definitely make them again. So happy you like them Patricia! 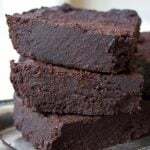 I have just started to eat low carb and am so happy I found this recipe. Will try it out asap! Hi Kate, let me know how you like it! Can one freeze these muffins? Hi Joan, of course you can! I made these this morning, and they turned out beautifully! I wish I could post a pic, hehehe! The only thing for people to be aware of, is that they are not sweet. If you like them sweeter, add a little more xylitol. My batter wasn’t crumbly at all, I used home laid fresh eggs, and pot set Greek yogurt. Yum! How long can the muffins sit out for before they get bad? As they do not contain preservatives, I would always keep them in an airtight container in the fridge. Then they’d last a few days. You can freeze them as well. Thanks for the recipe. It looks totally delicious. I am going to try this with a combination of coconut flour and almond and see how it turns out. Since there are 6 eggs, it should not be too dry. this will make it very low carb indeed. Ingrid, how did it come out combining the two flours? I would like to try it too! I don’t have weight thing can you tell me in cups? In the US ee have Yogurt. Is that the same thing? Plain, vanilla or what? Is therr a low carb yogurt, bc I havent found one if so? Thanks! Hello Angie, yes, it’s just plain full fat yoghurt or yogurt. When you eat low carb, it’s best to stay away from fruit yogurts or other ready-made sweetened yogurts such as vanilla (unless you make it yourself with fresh fruit and natural unsweetened full fat yogurt). Plain full fat yogurt will do nicely! Thanks so much for the recipe- I made them this morning as I LOVE sunday morning baking. I had a similar problem as someone above with the granulated batter. I measure everything with a food scale, but I wonder if it’s the brand of almond flour even though mine is “finely ground”. I also had stevia on hand and used that- normally the sweetness with stevia is a bit overpowering- but I taste no sweetness in these- is that normal? I am tempted to try another sweetener as I want to love these! Maybe you try to use a different brand of almond flour next time? Some are coarser than others. Definitely be sure it is made from blanched almonds with the skins removed – otherwise it’s just almond meal and would be more grainy. Generally though, the consistency of almond flour goods will always be a bit less fine than if you bake with wheat. It does not really matter which sweetener you use, whichever you prefer. 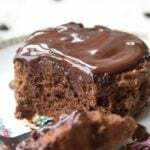 Add a bit more stevia next time (just try the batter) and make it just how you like it. I find this is very much a personal preference. I’m from the US so not very familiar with gram units. Is 1 serving size 1 muffin? I made these tonight and they are delicious for low carb! Thanks for the great recipe! Also, can you use full fat greek yogurt? Or soy yogurt? I am sure you can make it with either, though I have not tried it. If the greek yoghurt is very firm, consider diluting it so it has a full fat yoghurt consistency. Of course, using greek yogurt would increase the fat content as well. Is the yogurt for moisture? Can I use apple sauce instead? Yes, it it. Apple sauce could work! I’d be interested to find out how it works out! Hi Adi, I use a website called caloriecount which calculates the nutritional info. I don’t think it is a UK based website. Hi so I just made this recipe and they came out extremely crumbly, there was no batter it was more granulated. It seemed like there was far too much almond flour (I added 350 g). Unfortunately, I had to throw everything out. Any idea why this would happen? Hello Max, I a sorry to hear your muffins did not turn out. Did you use scales to measure? I have made the recipe many times and use it as a base for the healthy almond berry cake as well. The batter should definitely not be granulated, but more of a thick liquid, just like normal cake batter. You should be able to pour it. Hope this helps. Hi 🙂 can I use a coconut flour? Hello, I am sure it would work, although I have not tried this recipe with it. As coconut flour expands a lot, you would have to use a lot less of it though. I would try with 1/3 of the amount, so just over 100g. Good luck! Is the oven temperature for fan ovens? Hello Jaki, no, it’s for conventional ovens. Don’t they say to lower the temperature by 20 degrees if you have a fan oven? Try 160 degrees. I usually make time to sit for breakfast, even when I’m in Rome and have to go to work, I just set my alarm clock very early, since breakfast is so important to me 🙂 . Now that I’m back to Canada, I have plenty of time 🙂 . 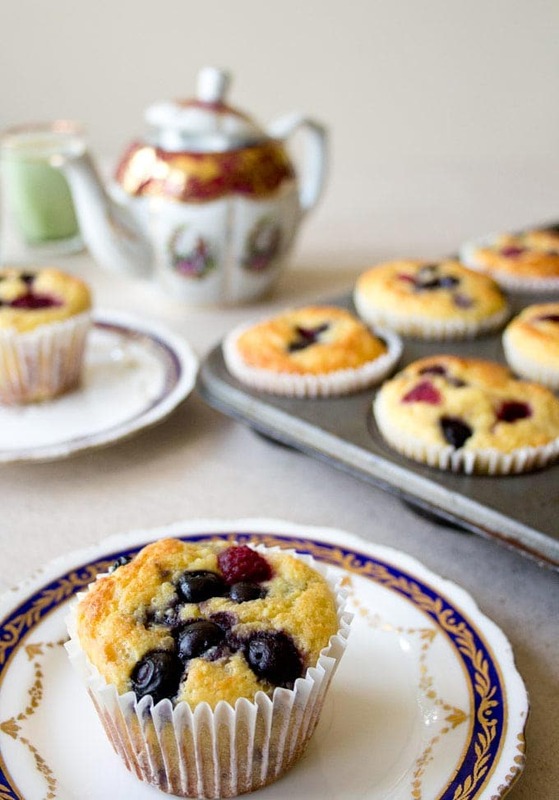 These lovely, delicious, muffins are on my to do list. I like baking with gluten-free flours and don’t like using (or using very little) white sugar. So they’re exactly my thing. Beautiful pictures and blog! I love anything grab and go bc as much as I try to plan ahead, I feel like I’m always rushing the kids out the door at the last minute. Best mom ever, I know. 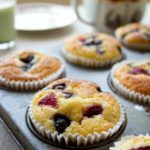 My kids would love these muffins and I love that they are gluten free! Hi they sound great but Can I use coconut flour instead ? You can definitely give it a go, just make sure you adjust the quantity as coconut flour is much more absorbent. I would try using 1/2 or even 1/3 of the amount and check that the consistency of the dough looks right. Oh dear, so sorry to hear that! Coconut flour is so different to other flours… I’d say New Year new try?